Shake & Glow Monkey Activity Toy is rated 1.7 out of 5 by 3. 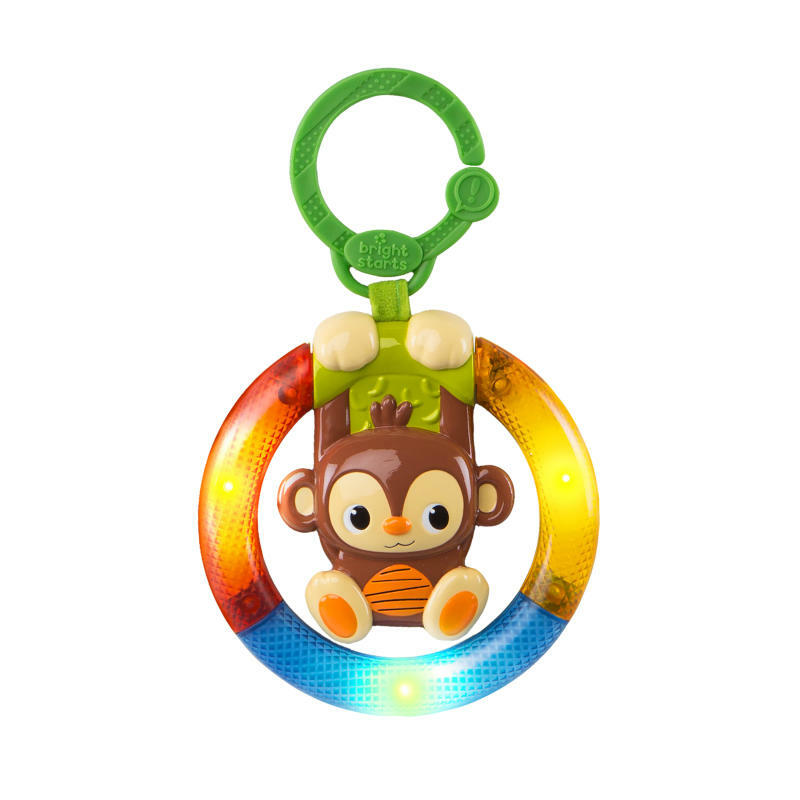 Go bananas over playtime with the Shake & Glow Monkey from Bright Starts! Your wild one will shake with laughter as his monkey pal swings back and forth with every tap and bat. Baby controls the show with easy-to-activate lights and a roar of jungle sounds. This monkey is ready to hang out wherever you go. Easily clip the silly toy onto your carrier or stroller, and get ready to monkey around! More monkey business means more belly laughs! Dimension (in) 1" x 5" x 5"
Rated 1 out of 5 by Simism from NOT FOR BABIES My little one got his foot stuck when playing (5 month old) and thankfully he didn't move too much so I could figure out how to get it out - not an easy task while he screamed hysterically! A shame as he loved the lights and sounds. Rated 3 out of 5 by Nicks Wife from Wish it worked right! My son is 4 months old, and we bought this when he was probably 1 month old. It started glitching and making crazy sounds within a month of having it, so I bought new batteries for it (which cost more than the toy itself), but the problem soon reared its ugly head again. So now we have this toy hanging on the infant carrier handle, in which my son can look at and touch, but that's all. No point in turning it on, because all it does it make a funny glitchy sound. Rated 1 out of 5 by Chark from DO NOT BUY Our 9 month old had this hanging on her pack n play and got her finger stuck. She was hanging there screaming until we could get her finger out. Not a safe toy for tiny fingers. Ours is going in the trash so no other child gets hurt.